After a raid uncovered that three ultra-Orthodox organizations have embezzled millions from the government, police revealed Monday that 40 other establishments were involved in the case. Six men were arrested on Sunday when police found more than a thousand fake ID cards at the offices of three nonprofit organizations that operate yeshivot in the Jerusalem area. The suspects allegedly falsified the records in order to receive monthly stipends from the Education Ministry for students who did not exist. Each of the suspects had a unique role in the forgery, an operation the police said was worthy of a "crime ring." "The investigation shows that dozens of organizations were founded and transferred fake names to the Education Ministry in order to illegally receive funds," a police official said. The police began to covertly monitor the illegal activity a few months ago, when members of the Neturei Karta sect found out their names were being used to receive stipends from the State, and informed law enforcement officials. During a preliminary hearing Monday a police official presented to the judge a photo album from which photos were taken for the fake IDs. One of the photos was featured on no less than three different cards. The official stated that every fake name that the organizations listed brought in 880 NIS (about $240) a month on average. Since there were more than 40 foundations, each reporting hundreds of fake names, the suspects embezzled hundreds of thousands of NIS a month for each organization, which amounted to tens of millions of NIS a year. "This system has been in place for many years," she said. "During yesterday's raid millions of NIS were found, some in cash, while some went directly to the pockets of the suspects and to other sources." Following the hearing, the Jerusalem Magistrate's Court decided to extend the remand of the arrested men by four days, even though the police requested a 15-day extension to avoid a disruption in the investigation. Attorney Yair Nehorai, who represents the suspects, responded by saying that since the police decided to release all the details of the case, including the names of the suspects and the way they operated, his clients should be released. "Every potential suspect knows exactly what he is accused of and who is involved, so we think the police's claim that the suspects should not be released to avoid disrupting the investigation procedure is inappropriate," he said. 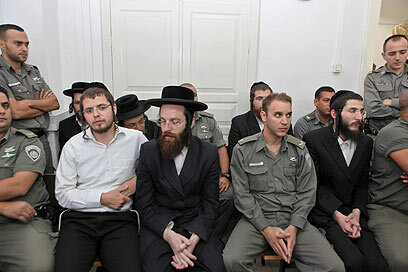 See all talkbacks "Police: Haredi ID fraud spanned years"